He was one of our honorees in 2015 in the Indiana Wounded Veterans Charity Ride and Car Show. He served in the United States Marine Corps from 2005-2009 as an Assaultman. He was deployed two times to Iraq from 2006 to 2007 and once again from 2008-2009. Nate currently lives and works in Indiana with his wife and daughter. Zach was one of our honored veterans at the 2015 Indiana Wounded Veterans Charity Ride and Car Show fundraiser. He served in the United States Marine Corps from 2005-2009. While in the Marines, Zach was an infantry squad leader. While deployed to Iraq in 2007, he was wounded and then was deployed again to Afghanistan in 2008. He received a purple heart for his injuries in Iraq along with many other service medals. He currently lives and works in Indiana. Alex was one of the honored veterans at the 2014 Indiana Wounded Veterans Charity Ride. He spent eight years serving as an active duty Marine in the United States Marine Corps from June of 2006 to September of 2014. While serving his country, Alex was an infantry assaultman and was sent on a total of three deployments. They included Iraq from 2007-2008, Iraq again from 2008-2009, then finally into Afghanistan from 2012-2013. He currently works as a Shift Supervisor for G4S Secure Solutions at FCA in Northern Indiana. His hobbies include fishing and making wood crafts. Justin was one of our honored veterans at the 2015 Indiana Wounded Veterans Charity Ride and Car Show fundraiser. He served in the United States Marine Corps from 2003-2007. While in the Marines, Justin was an infantry rifleman and tank gunner. On his deployment to Iraq from 2004-2005, he was injured. He received a Purple Heart for his injuries in Iraq along with other service medals. Justin currently is the owner of a landscape company/family farm in Indiana. He enjoys outdoor activities such as fishing, hunting, and spending time with mother nature. Josh was one of the honored veterans at the 2016 Indiana Wounded Veterans Charity Ride and Car Show. He served in the United States Army from 2006 through 2014. While serving, Josh did one tour of duty in Iraq from July of 2009 to September of 2011. He currently lives with his wife and five children in Indiana and enjoys riding his Harley Davidson. Eddie was one of the honored veterans at the 2015 Indiana Wounded Veterans Charity Ride and Car Show fundraiser. He served in the United States Army from 1969-1971 as an aircraft crew chief on a UH1H and UH1C helicopter. He has over 2,000 hours of flying time in those particular aircrafts. In February of 1970, Eddie was deployed to Vietnam where he was with the 71122 Platoon Battalion 240 Saw Helicopter Company. He has been affected by agent orange in later life since becoming exposed to it while deployed. Eddie is currently retired and lives in Indiana. Nathan was one of the honored veterans at the 2014 Indiana Wounded Veterans Charity Ride. He served in the United States Army from 2007 through 2012. While in the military, Nathan was an air assault infantryman. He did one tour of duty in Afghanistan. He currently resides in Indiana and is a VA officer for Delaware County. Nathan enjoys shooting guns and being a father. ​ Chris was one of our honored veterans at the 2015 Indiana Wounded Veterans Charity Ride and Car Show fundraiser. He served in the United States Army as an airborne infantryman. Early into his deployment to the middle East, Chris was injured and received a Purple Heart for his injuries. He currently is giving back to veterans through a non-profit called Heroes Meeting Heroes. He currently lives and works in Indiana. Murphy was an honored veteran at the 2014 Indiana Wounded Veterans Charity Ride fundraiser. He served in the United States Marine Corps doing artillery from May of 2008 through January of 2013. In 2009, he went on a non-combat deployment to Japan and another deployment in May through September 2011 to Afghanistan. While in Afghanistan, he stepped on an IED on September 11 and is a below the knee amputee. He received a Purple Heart for his injuries. Murphy currently works and lives with his wife and two children in Indiana. He works as an EMT for American Medical Response. He enjoys weight-lifting, winter sports, video games, and spending time with his wife and children. ​ Rick was one of the honored veterans at the 2016 Indiana Wounded Veterans Charity Ride and Car Show. He served in the United States Marine Corps from 1967-1970 and the United States Army from 1973-1996. While serving in the military, he was deployed to Vietnam from November 1967-December 1968. He also was deployed to Cuba and was located there from February 1969 through July 1969.. He received numerous service medals in his many years of service including a Purple Heart. After retiring from the Army, Rick was a volunteer fireman for 40 years in Indiana. He is currently retired and lives in Indiana. Jeff was an honored veteran at our biggest event of the year in 2016; The Indiana Wounded Veterans Charity Ride and Car Show. Jeff served in the 82nd Airborne Division of the United States Army from 1988-1996. He spent two years overseas in Saudi Arabia, Kuwait, and Iraq. Jeff currently works for the United States Post Office and enjoys spending time with friends and family. ​ Jeremiah was one of the honored veterans at the 2014 Indiana Wounded Veterans Charity Ride. He served in the United States Army from August of 2000 through November of 2005. He was a petroleum supply specialist and fueled helicopters at Ft. Hood in Texas with the 1st Cav 1/227 for about 18 months. After 9/11, he was sent to Germany with the 1st Armored Division 1/37 Tank Battalion. While in Germany, Jeremiah fueled aircrafts, secured supplies of ammo, food, water, and other needed supplies. Jeremiah and his unit were upon the first of military troops to arrive in Baghdad, Iraq on his first deployment. While overseas, he was then extended another three months before getting moved to Karbala, Iraq where he performed similar duties. After too many accidents during his military service, Jeremiah was medically discharged in November of 2005. Jeremiah is currently retired/disabled and spends his time trying to help veterans in any way he can. Due to his injuries during service, Jeremiah can often be found attending doctors visits 1-3 times a week. However, this doesn’t stop him from working out or riding his Harley Davidson. Jeremiah also has a passion for renovating his 1962 school bus into an RV and his enclosed trailer into a toy hauler all while keeping his wife a happy camper! 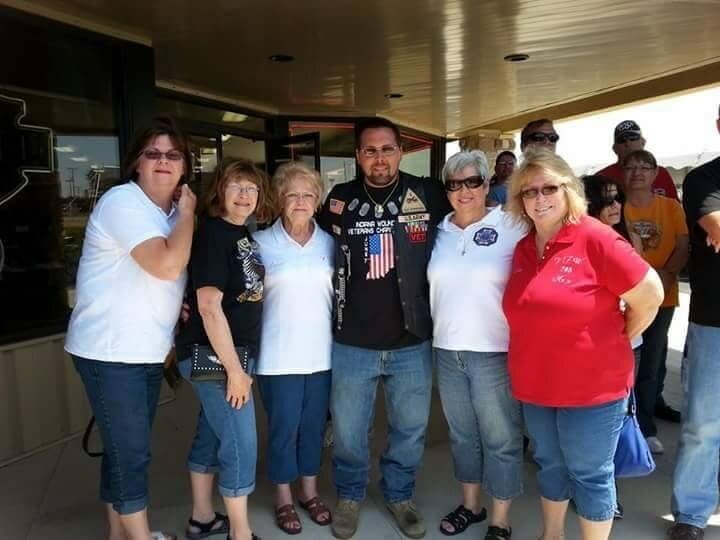 During the warmer months in Indiana, Jeremiah often rides his motorcycle with the InPGR, VFW riders, and American Legion Riders in missions supporting veterans and military organizations. He does whatever he can by living or riding his motorcycle to honor and remember his fellow service members.